Pammy Blogs Beauty: No Time to Moisturize? Think again: Spray-on St. Ives Fresh Hydration Lotion! No Time to Moisturize? Think again: Spray-on St. Ives Fresh Hydration Lotion! I know that many of us have this delimma: you are in a rush to get ready and you don't have time to apply moisturizer and let it sink in before throwing on your clothes and heading out the door. In an ideal world, we would have as much time as we need to get ready every morning, right?!?! Well, unfortunately there are certainly many days that we just struggle to get up, down some coffee, and head out the door. Well, the good news is that our skin doesn't have to "suffer"! lol! Spray moisturizer to the rescue! I will admit, I have been intrigued by spray moisturizers ever since they came out. So, I am excited that I am finally trying one!!! 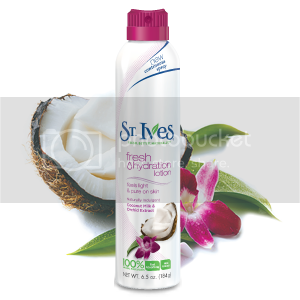 St. Ives Fresh Hydration Lotion is a super lightweight spray moisturizer that just takes minutes to apply and absorb. It is the ticket to getting out the door quickly and moisturized! This super lightweight lotion is in a super convenient and fast-to-apply spray form! You literally just spray it right on your body and then lightly rub in. The liquid-like lotion absorbs almost instantly and allows you to get dressed right away (you don't have to wait on "dry time"!). The lightweight lotion provides light hydration and leaves your skin feeling soft and moisturized. This is great for normal skin types and body skin that is not overly dry. I think that this formula will be ideal for Spring and Summer moisturization (as my skin is on the very dry side right now). The lotion feels somewhat "cooling" going on and will be a nice treat when the weather is a bit warmer. For now, I am using this lotion when I am in a super-hurry to get dressed. It really does allow you to get ready quicker! Plus, I absolutely adore the Coconut Milk & Orchid scent! It is just lovely!!! 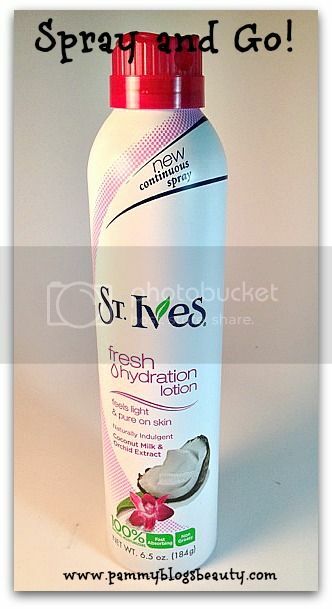 St. Ives Fresh Hydration Lotion is available at drugstores for about $6.99 a can. I highly recommend checking this product out if you are looking for a lightweight spray-on moisturizer!